The fundraising dance event featured 12 couples doing the salsa, the tango, the Charleston, the jive, the paso doble and a bit of disco on the side. RTÉ’s Dancing with the Stars eat your heart out! 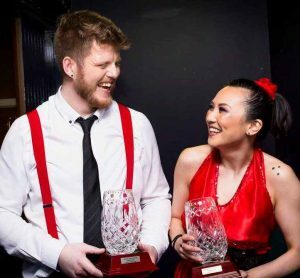 This year’s annual Ozanam Come Dancing event raised more than €41,000 for summer youth programmes run by the Society of St Vincent de Paul (SVP) in Dublin. The event featured 12 couples doing the salsa, the tango, the Charleston, the jive, the paso doble and a bit of disco on the side. Tickets were much in demand and the Liberty Hall venue was completely sold out. The dancers included SVP staff, SVP volunteers and couples from companies that actively support the work of St Vincent de Paul, especially the Ozanam House Resource Centre, which offers needy young people a wide range of activities during the summer months. These firms include McCann Fitzgerald, Abbey Capital, Symantec, Danceworld, AIB Bank and the Business in the Community Ireland organisation. The centre on Mountjoy Square in Dublin 1 is busy throughout the year. More than 500 people use its services every week, with their ages ranging from under two to over ninety. None of the participants had danced competitively before, but by all accounts they put on a stunning show after only nine dance lessons. More to the point, they raised a total of €41,150. The event was hosted by TV3 presenter Brendan Courtney and the judges were world ballroom champion David Roberts, TV personality Katherine Lynch (fresh from the aforementioned Dancing with the Stars programme) and singer Mary Black, who included a performance of her own as part of the night’s entertainment. In the end, jivers Rory and Joanna danced away with first prize after putting on a dazzling display for the packed crowd present. Orla Keeshan of White Lane Photography volunteered her time and created a fantastic visual record of the night. For more information about the Ozanam House Resource Centre, visit www.ozanamhouse.ie.